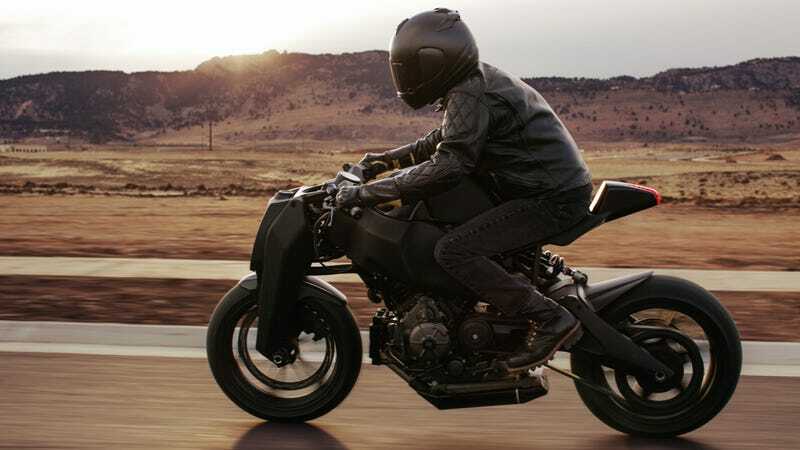 When Denver-based Magpul debuted its mad, avant-garde, Buell-based Ronin nearly five years ago, they hinted at building a dozen or so for sale. I didn't believe them. Now I'm eating my words and I couldn't be happier. Most bike customizers follow a recipe. Strip it down, build it up, add a few bits and baubles, and call it a day. It might be a customer bike or a commission, but the chances of it being ridden are about the same as building a series. The Ronin is the exception. It starts with a Buell 1125R. You can still see the chunky frame and swing arm, and they also kept the perimeter front brake and belt drive. From there, they swapped out the entire front end with a linkage fork, with 13mm more trail and an adjustable Penske mono-shock soaking up the bumps. Then there's the sinister headlamp/cooling system up front, with its asymmetrical lights and single core radiator, which has an integrated overflow tank hidden inside one of the fork legs. They managed to stay true to the original concept, and I say it looks even better. A stainless steel exhaust with aluminum ends keeps true to the Buell design, running underneath the engine to keep the center of gravity low. The electrical system has been ripped out and rebuilt from scratch, and a new ECU tune has been applied to make better use of the breathing mods. Little things stand out, like the front turn signals incorporated into the bar-end mirrors, the CNC-milled aluminum rear subframe, and a custom levers with a low-profile master cylinders that smooth out the top of the cockpit. They've even ditched the key for an RFID fob and machined new controls for the signals, lights, start/stop switch, and instrument cluster. Magpul is so serious about the project that it's been spun off into its own company, Ronin, and they're building 47 bikes, each named after the 47 ronin warriors from Japanese lore. The first 12 bikes in a silver/black scheme will be sold for $38,000 a piece, followed by another 10 all-black bikes. From there, they'll release eight, then six, four, two, and a final five, each with a different livery – and a higher price. It's a bit convoluted, but such is the price for a rolling piece of art.